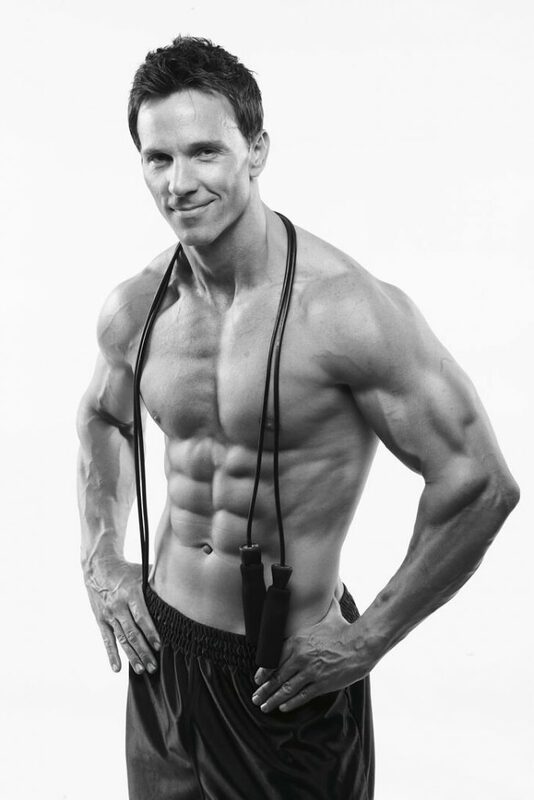 Developed by health expert, professional fitness trainer, and Men's Fitness cover model, Robert Marting. What Exactly is The UBAA System? 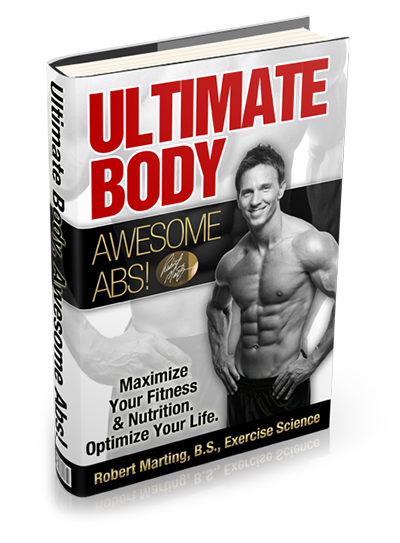 The core system of “Ultimate Body, Awesome Abs!” is modules of hi-definition videos and PDF files covering everything you need to know about how to program your mind and body for constant fat loss and better fitness. Over a short period of time, these tactics will become habit and your body will be given no choice but to adapt and show you the results you are programming it for: anti-aging and an INCREASED QUALITY OF LIFE. That’s what it is all about. With UBAA, there is no “graduation” and then you’re done in ‘X’ amount of days. Then what? In fact at the method’s core, you never stop training. That’s how you maintain awesome results for the long term. If you fail to maintain your car, what happens? It collects dust, is hard to start and performance goes downhill; the human body is no different. My methods focus on the knowledge, balance and motivation that propel you to be consistent. This progam is about building the habits needed for serious anti-aging results without being a “fitness robot”. Like me, you should enjoy life too! Being too strict on yourself only leads to burn-out. This way you can reward yourself, adapt and become more advanced. So, with enough know-how under your belt you can and will achieve constant results just like I do. This program is not a 90-day fad course but a blueprint for the long term. Results can and do happen faster for some but the human body reacts to positive stress over time. We must stay focused on the things that get the results we want, most of the time. For example, I use a simple 75/25 rule. 75% of my week is spent doing the things that bring desired results and the remaining 25% I do what I want (including a fair share of not-so-healthy food and drink;). As I stated before, it’s all about balance and enjoying your life; at the same time staying on course to the goals you have set for yourself. The 75/25 rule is just one of many methods explained in this Ultimate Body, Awesome Abs! program I use to help make that happen. Robert Marting’s Ultimate Body, Awesome Abs! 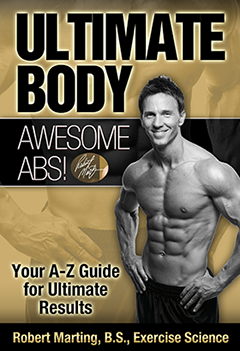 (UBAA) is a 170-page comprehensive guide to achieving an awesome, well-balanced body and keeping it for the long-term. This book includes six main chapters starting with a section on goal assessment and mindset to the most effective movements for full-body and specific muscle groups, including Abs. All the movements are easy to see in large, full color photographs which number over 110 in total. A unique chapter on cardio methods exposes the truth about treadmills, jogging and one of the most effective methods to get great shape: hill sprints. Counting calories: Is it really necessary? The longest chapter, The Fuel (nutrition) covers in detail which foods work with your unique body type and goals, walking you into the grocery store listing exactly what types of food you should be stocking up on and what you need to avoid. It then takes you a step further breaking down effective tactics for how to stay on track while dining out or on the road for extended periods of time. Example weekly menus and insight on fast-food, alcohol and junk food are also covered so you know what to avoid, what to eat, how much and when. Read by Robert Marting himself, you’ll have this amazing training manual in audio format if you don’t feel like reading it or, listen while you travel. Hearing Robert explain his powerful methods in audio will have you more motivated to achieve the goals you set for yourself. This bonus brings all the information you will learn to a whole new level! Focusing on the safe and correct form of weight training’s most effective movements, the DVD has helped thousands of people worldwide achieve great results, save time and avoid injuries. I’ve seen it sold worldwide for $19.99 and up. This video started it all- showing the right and wrong ways to perform resistance training’s most effective movements at home or in the gym. Stop wasting valuable time and effort with incorrect form. Safeguard against possible injury and learn correct breathing technique. Learn proper and effective techniques to maximize results. Increase strength and flexibility while getting the body you want. Identify the RIGHT and WRONG ways to perform the movements. Use basic stretches for injury prevention and increased ROM. Train with Robert Marting on video! These info-packed DVDs are being sold now at online storefronts including Walmart, Sports Authority and CBS Sports Store.com for $19.99 a piece plus shipping. Volume 2 includes the most effective muscle-building, fat-burning movements you can do for the upper body. Safe and effective technique is covered for each movement so you know what to do the next time you set foot in a gym! Great form is the key to muscle gain and fat loss. A powerful, well defined chest- apply the best movements from different angles for optimum results and balance. Amazing arms that you’ll be proud to show off- a two pronged approach with movements targeting the biceps and triceps. A defined, strong back giving you that amazing V-taper look! This look makes your waist appear even leaner! (you’ll see how). Bonus nutritional information and sample menus are included to make grocery store visits easy. When it comes to burning body fat and actually seeing your Abs, training your legs is one the best thing you can do. Why? The short version: The muscles of the posterior chain include the largest and most metabolically active in the human body. The even shorter version: Muscle eats fat for lunch! Perform the most effective leg movements to prime your body for 24-hr fat burning mode. Protect your back and make it stronger by avoiding the most common postural mistakes that put your back at risk while performing lower body movements. Increase your flexibility, lean musculature and results at the same time by using the principle of full range of motion (ROM). See your legs develop shape and separation in the quad (front) and hamstring (back of the legs) muscles like never before. Develop diamond-shaped athletic calves; learn which movements you must do to get this elusive look to awesome total leg development. See which AB movements help chisel out that 6-pack you’ve always wanted- from the lower “V” AB look to the upper washboard squares. Does Your Book Include Workout Routines and Instructions for How to Train Properly? A) Yes. Proper technique is KEY. Robert Marting is a stickler for perfect form, producing the instructional DVDs “Great Form Equals Great Results” focusing on safe and effective technique with weight training movements. All of the most effective movements for each muscle group are individually covered in detailed descriptions and photographs, then described in the last chapter exactly how to put them together to construct the most result-achieving workouts for your goal in mind. Exercise sequence, frequency and rest time are all important pieces to the puzzle. Is Ultimate Body Awesome Abs! About Losing Fat or Gaining Muscle? For life-long results, both of these outcomes complement each other and happen simultaneously when you know how to “program” your body to do so. The more muscle you put on your frame, the more extra calories and fat your body will burn around the clock-even in your sleep. This is the real beauty of Robert Marting’s Ultimate Body, Awesome Abs! Robert explains exactly how to make this happen nutritionally and physiologically with the right training tactics for YOUR body type and goals in mind. The Ultimate Body “program” is actually much more than that. It’s the manual for optimal health and fitness for life. The tactics within it are scalable to one’s goals and unique metabolic characteristics- they have to be. We are all different! I Want Abs. Is the Ultimate Body Program about How to Get Abs and Keep Them? Yes, maintaining your results is a huge part of the game. The “program” is about achieving optimal health and seeing your Abs is probably the best byproduct of your efforts. We all have abs, granted we all can’t see them but they are there. UBAA (Ultimate Body, Awesome Abs) is about how to maximize your genetics through the most time-efficient and effective fitness tactics in the business- achieving lasting results. Since most of the folks out there have the same problem of losing unwanted belly fat, this is a major focus of the book. Is UBAA for Men or Woman? Both, without a doubt. The best modes of exercise are the ones that program the body for an increased metabolism around the clock and accelerate fat loss. These training methods also work to produce fat burning hormones regardless of gender. As stated before, UBAA is scalable for each individual. The things that would most likely change for women is the fact their nutritional intake would include less calories and maybe the poundage and intensity of their training. Lifting those cute little pink dumbbells for endless repetitions won’t get you the results you’re looking for. Just like men, woman can amp up their training methods by actually soliciting a fat-burning hormonal response in the body. And no, you WON’T get big, bulky muscles! Many women fear this; UBAA sets the record straight on this topic. Learning to sequence the right movements, combined with the right foods will yield amazing results; man or woman. What Will My Body Look like If I Follow the Program? However you want it to look. You see, we each have a unique body type and metabolism. We each respond differently to exercise and different types of foods; therefore we must train and eat to our own specs and goals. The UBAA program is based on these unique specifications and goals that we each have. Granted, most of us want to be healthy and lean, sporting a six-pack set of abs wouldn’t be too bad either. This is NOT out of reach. All we have to do is identify our body type, train and fuel the body accordingly and the results will follow. The body will respond well if you give it no choice but to succeed. UBAA explains exactly how to do this in full detail- if you want to gain or lose weight, become stronger and more muscular or lighter and faster- all the bases are covered. This is a totally customizable solution for the long term. But as you’ll find out it’s not really what you do but how you do it that brings the desired result. You will see there is a training method and strategy for different goals. Do I Need to Take Those "Fat Burner" Supplements for Ultimate Success? No. Many of these products offer nothing more than a confusing list of “proprietary” ingredients and are a waste of money (It’s discussed in detail)The UBAA program is based on natural, unprocessed foods and effective training methods for Ultimate results. Nothing else. In the book, Robert Marting goes into detail about fat burners and what to look out for; however he does not recommend taking them without doing your research. First and foremost, get your training and your nutrition in order. Supplements are not a necessary factor in your success. Making the right food choices and smart training methods ARE. Do I Need to Follow a Special or "Extreme" Diet to Get Ultimate Results? No. There really is no such thing as a diet- just good and bad food choices. Fad diets come and go and only prolong diet difficulties. Don’t fall for it! The UBAA “diet” is quite simply just smart and healthy eating for the long haul. No processed foods, no extreme vegan or low carb fad diets here. Those are just that- FADS. UBAA is all about taking in natural, unprocessed foods. The foods we were meant to eat and the kind that bring results, not hinder them. Over time, the processed and “health food” industries have become riddled with so many fillers, preservatives and practices that have made food so unhealthy it’s no wonder our waistlines have expanded. The UBAA program identifies these foods and ingredients to avoid and lists what you should be stocking your kitchen with. The book even breaks down a typical food label for you in plain English so you know what to look for when checking the ingredients on a particular food item. Is Robert Marting’s UBAA a Fast Answer to Fat and Weight Loss? No. UBAA includes effective strategies to achieve the body you want for the long term. Fad diets, garbage supplements and hokey infomercial products all promise results over night yet the only thing that gets thinner is your wallet. Robert Marting employs proven fat-loss methods based on science. It took time to put on those extra pounds and inches and it takes time to get them off the right way as well. Faster results are possible; yet many variables come into play like age, fitness level and dedication to your goals. Basically, you are in control and with the right knowledge anything is possible. This is what UBAA is all about. I’m Not a Member of a Gym. Do I Need Any Gym Equipment to Perform These Methods? No. Many of the movements discussed in UBAA require your own bodyweight and a set of dumbbells-That’s all. However, more advanced movements and methods in a fully equipped gym are also covered so your prowess and abilities are constantly challenged to improve. As you’ll find out, aiming for constant improvement instead of perfection will keep the results coming and simplicity is key! What If I Am a Beginner? Is Ultimate Body, Awesome Abs! An Extreme Program? Many would think so. After all, the results Robert Marting achieved for himself and many of his clients are worthy of magazine covers. The reality is that we all had to start somewhere. We all learn as we “go and grow.” This is how we become who we are today. UBAA is not an extreme program by any means. Rather, it is a collection of knowledge and methods that provide you with the know-how to take charge of your health and fitness from the ground up and challenge you all the way to advanced levels. It can’t be stressed enough that the knowledge you will gain sets the stage for you to constantly evolve, improve and produce your own amazing results. This is what sets UBAA apart from all the other “programs” out there. Is It Safe to Order the Book Online? I Hear about Online Fraud and Identity Theft Being More Common These Days. It’s understandable to be a safe skeptic about anything, especially your online financial well-being. The truth is in this day and age, online payment processors are so advanced that they offer more security than traditional forms of payment. Ordering online is more secure in that a person does not have access to your critical information like phoning in an order or giving your information to a sales clerk for anyone to see- you input your information on a secure online form and only the merchant bank can process it. Nobody else has access to that information. There is an ever-evolving technology called SSL (secure socket layer) to protect your information and the transaction from being viewed by third parties. Without getting too technical, this technology provides a unique channel of communication between you and the merchant bank for the transaction to take place. The layer of security these SSL’s provide is somewhere in the ballpark of a trillion times stronger than if used without it. This site provides the option to use Clickbank or Paypal, the most popular online credit card processors in the world; as such they both offer an outstanding reputation for security. When making a purchase on this site, you’ll notice that once you key in your payment information the http in the URLat the top of the screen will change to an https; this lets you know you are now on a secure page that implements SSL technology. What Exactly Is an Ebook / PDF Book and How Do I Download It? An eBook is an electronic version of a book. It is a much quicker way to get your hands on the information you want. It’s quicker in that you don’t have to drive to a bookstore to locate it or wait for a physical book to be shipped to you. After ordering, you will be able to immediately download UBAA in Adobe PDF format and read it on your computer, iPad or Amazon Kindle. Or if you wish, print the entire book out and read it on paper. Does It Matter What Country I Am in to Order? What about Different Types of Currency? No. It does not matter where you are or what type of currency you use. Our secure online payment processors automatically convert any type of currency from any country in the world to make the transaction hassle-free. It really is the easiest way to get the program you want in no time at all. I bought your course last month. Happy to report that I love it and am getting results. Boy I had to swallow my ego and lower the weight. Your super sets kill me...in a good way. Question: When you will you release the second month videos? My jeans are lose and my stomach has gotten tighter and love handles have gotten smaller. I can't stand looking at these celebrites who get plastic surgery or lipo because that's not real. Real is you. This world needs more role models like you. I'm glad I can work out at home. Thanks for being a role model for me and others as well. I CAME UPON YOUR VIDEO ABOUT 3 WEEKS AGO. I USED TO RUN FOR 40 MINUTES 4-5 DAYS. NOW I DO SPRINTS ONLY. THE DIFFERENCE IS AMAZING, MY BODY IS CHANGING REALLY FAST. I USED TO HAVE TO TAKE A NAP AFTER RUNNING 40 MINS BUT SINCE I'M DOING SPRINTS I NO LONGER NEED THE NAP, I HAVE SO MUCH ENERGY, WOW. ALSO, THANKS, FOR TAKING THE TIME TO ANSWER ALL THE QUESTIONS AS WELL. I'VE LEARNED ALOT AND MY CARDIO CONSISTS ONLY OF SPRINTS. I AM A BELIEVER HILLS DO WORK. Hi, Robert. Hope you had a lovely Thanksgiving. Just a check-in about my workout status. I don't know if I told you earlier, but I quit my job on October 1, so I've had plenty of time to maintain a schedule at the gym. Also, since I'm not going to an office now, I can wear casual clothes every day. So now I'm doing some contract work with our state crime lab, and I had to go for a visit today to a satellite lab. The dress pants felt too big, and my shirt was tight. I'm not measuring myself with a tape or anything, but the evidence at my disposal seems to indicate that the supersets are working. A very happy Christmas to you. DUDE, U LOOK 25, NOT 40. STELLAR ABS & CHEST!! GREAT TO HAVE SOMEONE GIVING INFO TO THE OLDER MEN. I AM 50 STILL PART TIME MODEL. MIKE CHANG LOL,TRAINERS HATE HIM ACCORDING TO HIM ,ITS MANIPULATIVE ,ESPECIALLY WHEN HE LEARNED HIS IDEAS AND TRAINING TACTICS FROM TRAINERS ,ESSENTIALLY . I WOULD RATHER FIND REAL PEOPLE LIKE ROBERT MARTING TO LISTEN TO ,WITH DOWN TO EARTH ADVICE ,AND NOT MARKETING HYPE . THANKS FOR THE VIDEOS ROB. I AM STARTING A BUILDING PHASE FOR A BIT OF EXTRA MUSCLE AND WILL INCORPORATE INTO IT TO SHED SOME BF...THANKS AGAIN.. I ACTUALLY THOUGHT YOU WERE GOING TO BE ANOTHER SELF PROMOTING BAW BAG, BUT YOU ACTUALLY KNOW WHAT YOU'RE TALKING ABOUT AND HAVE SOME GREAT ADVICE! THANKS. Do you want to look and feel ten years younger or ten older? The choice is yours to make. Just ask Men's Fitness cover model Robert Marting, now in his 40's. Hi my name is Robert Marting, Fitness Professional. You may have seen me on the covers and spreads of various magazines like Men’s Fitness or have seen my instructional resistance training DVDs “Great Form Equals Great Results” in online storefronts like Walmart or Sports Authority.